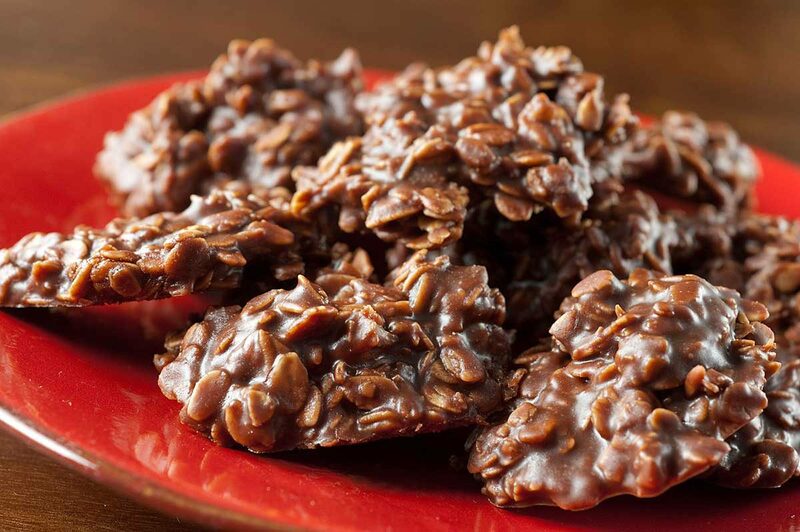 No Bake Cookies are a classic for a reason. 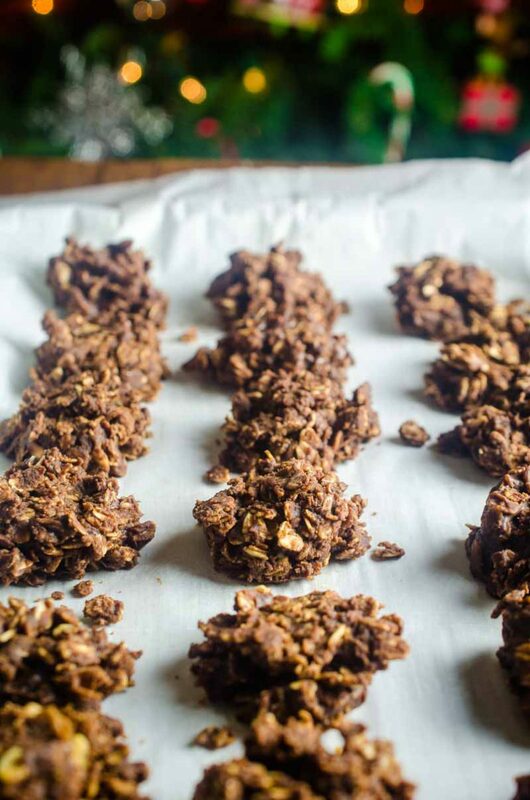 These chocolate peanut butter oat clusters are always a hit. And they are beyond easy too! When I was growing up my mom, sister and I would always pick a day during the Christmas season and make a whole bunch of cookies and sweets, package them up at the dining room table and then give them to family and friends. It was our way of saying Merry Christmas. It was always something that I looked forward to. And it is one of the traditions that I like to continue now that I have moved away. Just one smell of the chocolaty peanut buttery-ness that is these no-bake cookies and I’m transported back to my mom’s dining room table. 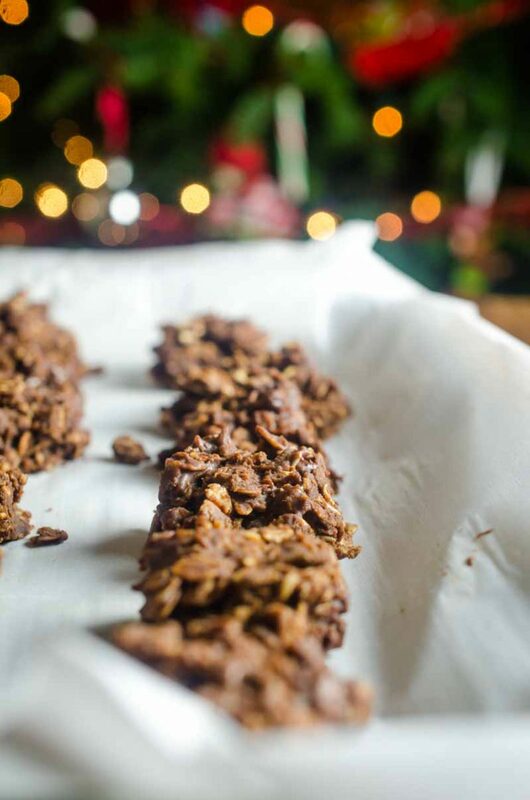 What ingredients do you need for no bake cookies? That is the great thing! 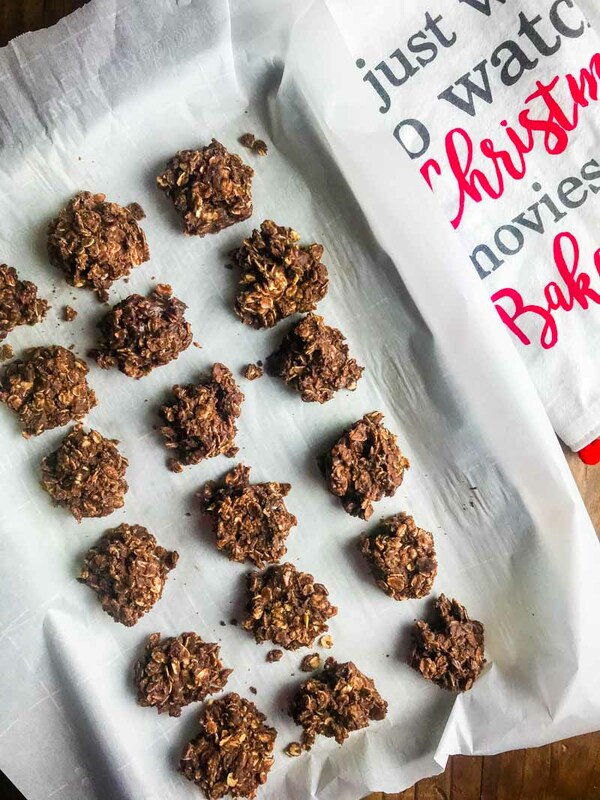 You don’t need many ingredients for no bake cookies. In fact you only need 7. To make these no bake cookies you will need peanut butter, cocoa powder, butter, sugar, milk, vanilla and oats. How long do you boil no-bake cookies? You will need to boil the cocoa mixture for about 1 minute. Nope! That makes them perfect for all of your baked goods gift bags this year! These are pretty popular cookies and I’m sure you’ve tried them before, or know someone who has. You might even have your very own recipe. It may be similar to this or may be completely different. My mom got this recipe from a friend. I’m not sure where her friend got it from. But all I know is that this is how we made them in our house. This is the recipe that really brings back all of the Christmas memories for me. What brings back memories for you? Combine sugar, butter, milk and cocoa powder in a saucepan over medium heat. Bring to a boil. Allow to boil for 1 minute. Remove from heat. Stir in vanilla. Place peanut butter and rolled oats in a large bowl. Pour chocolate mixture over the top. Mix well. Line baking sheets with parchment paper. Drop tablespoonfuls of mixture onto paper. Allow to cool. Cookies will harden as they cool. My Granny & I use to make these when I was little , I lost her in July she was 89 . the cookies are really good my kids love them. these cookies are really good if you like to eat peanut butter. i love these cookies. My Mom always made these, and I make them with my girls. This makes me want to make some today! Thanks for all of your fabulous recipes and gorgeous photography! : ) These remind me of home ec class in 7th grade. Haven’t made them in years. Thanks for the flashback. Ahhhh, yes the holiday baking season is upon us. My grandma would spend days baking goodies for us!! These cookies never made it onto her plate, but I have had them numerous times since than. They are so simple and delicious! My mom’s grandmother’s stay-up-all-night-cookies :) Meringue cookies with chocolate chips in them. My mom only made them around Christmas, so that’s what I think of. Aah, my favorite cookie of all time! Been making these since I was able to reach the stove. I usually add coconut and chopped pecans also. Yum. Love the recipe. What brings Christmas to me? I definitely love the food because some of the things are eaten only once a year. But I’m working to get away from that thinking. So I also love decorating my home. I don’t go overboard, and have a fake tree, but I love sitting on the couch, in the dark, with only the Christmas tree lights blinking at me. Really means “peace” to me. Something in short supply this year. 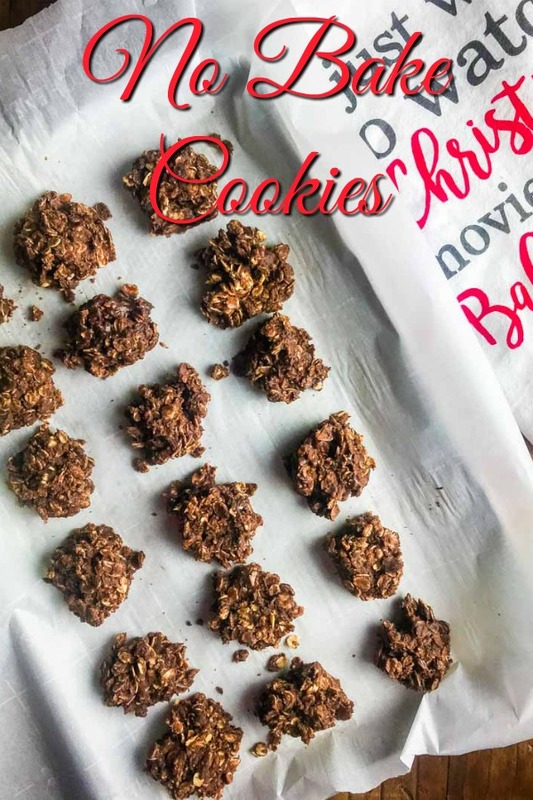 I’ve never made no-bake cookies but these look fabulous!